We will be on the air today with our host Annie Rivera from "Annie Talks". 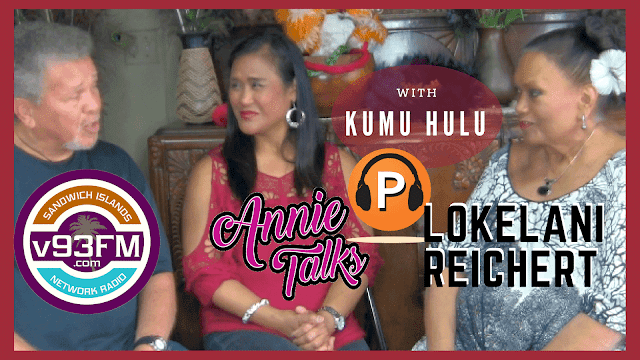 The topic will be Annie Talks and Sandwich Islands Network Radio talk with Kumu Hulu Lokelani Reichert and her passion to preserve the art of feather lei pua-making. Uncle Kamaka Brown and Annie had the absolute joy of speaking with Kumu Hulu Lokelani Reichert who is the Kumu (teacher) of the Hawaiian Feather Pua workshops. We learned more about her quest to perpetuate the almost forgotten craft of feather Pua making. Kumu Lokelani is very passionate about keeping the art form alive and thriving. She really does give so much of her heart to do so, too. When we met with her, you can feel her passion and her love for the art as it just radiated through the way in which she spoke about it.